In part one, I discussed the way Tupac Amaru II and his followers used art and material culture to subvert Spanish colonial hegemony. Now, I will explore how the colonial state responded and how these struggles connect with our present moment. Let us take perhaps the most iconic example of state-sanctioned iconoclasm in the Andes: the portrait of Manuela Tupa Amaro, matriarch of the Betancur family who litigated against José Gabriel Condorcanqui for the coveted title of Marquisate of Oropesa in the 1770s. Both families claimed direct descent to Tupac Amaru I and this particular title would have helped to solidify their connection to an illustrious Inca lineage and gain proximity to Spanish colonial power. Paintings of the indigenous nobility like this one participated in the litigation process as visual “proof” of Inca royal blood. At some point after 1781, the portrait was hastily overpainted with an image of the Lord of the Earthquakes (Señor de los Temblores), a Cusqueño religious devotion. The covering up of the original image was enacted in accordance with Areche’s decree, which stated that the portraits of Incas and their descendants are to be erased so that “no sign remains [of the original image]” (de modo que no quede señal), and that they should be substituted with portraits of the king or other Catholic sovereigns. Yet archival photographs from the 1970s indicate that the portrait of Manuela Tupa Amaro could be easily detected under the thin layer of paint bearing the image of the Lord of the Earthquakes, calling to mind the Roman practice of damnatio memoriae, in which artists left behind traces of the original emperor’s visage in order to visually demonstrate his subordination to a new monarch. Right: Lord of the Earthquakes (overpainting of the portrait, which has since been removed by restorers), ca. 1781-1800. Archival photograph by Francisco Stastny. The previous examples discussed in Part I of this essay often fall under the rubric of iconoclasm or vandalism. The example of Manuela Tupa Amaro, on the other hand, is most frequently described as an act of censorship. Yet each of these acts entails an intervention into the material world. They all function to subvert the original function or meaning of the object during a moment of social and political upheaval. The only thing differentiating an iconoclast, vandal, defacer, or censor is the intervener’s proximity to institutional authority. When the brush or knife is wielded by a representative of the hegemonic power, the legitimacy of the intervention is upheld; when wielded by an insurgent, the act becomes classified as deviant. The intentional defacement of the power-laden symbols of the dominant culture undermined the religious, social, and cultural systems that served as its foundation, and which perpetuated the myths of political glory and ascendancy. The phenomenon of rebels and counterinsurgents modifying the visual realm can be found across the Atlantic world, with the Andean insurgencies of the eighteenth century serving as but one case study. The examples described here can also provide a framework for understanding contemporary events, allowing us to establish a genealogy of revolutionary iconoclasm from Tupac Amaru to 2017. As I write this essay, we are witnessing increasing attacks on the civil liberties of marginalized people, whose bodies and futures remain in jeopardy at the hands of an administration that has weaponized state power against its most vulnerable communities. Fast forward two hundred years, and we find uncanny similarities in the quest to maintain ascendancy over politicized images in public space. One example that some New Yorkers may recall is the controversy around the “Stop Snitchin” mural painted in East Harlem by the Bronx-based graffiti collective, Tats Cru, in 2006. The message of “stop snitchin” refers to the refusal among some community members to cooperate with law enforcement. The tensions between police and communities of color in Harlem and the Bronx at the time of the mural’s creation had reached an all-time high with the implementation of stop and frisk, a racist policy that authorized the searching and detaining of anyone perceived to have committed a crime without a warrant. The policy led to grossly disproportionate detaining of Black and Latino men, with only a fraction of these stops actually leading to arrest. Painted against the backdrop of stop and frisk, the rise of gentrification, and the increased disenfranchisement of East Harlem’s residents of color, the mural emerged as a response—however controversial—to the conditions of the moment. The covering of the mural with buckets of gray latex paint was proudly publicized and transformed into a photo-op by elected officials. Like the Manuela Tupa Amaro portrait, we witness here an example of the overpainting of an image being coded as censorship rather than iconoclasm because the content of the original image ran counter to the values espoused by the dominant power. 2017 has marked a new era of confrontations with fraught national symbols that exalt histories of genocide and slavery. Each day seems to bring a new story of a protest condemning statues of confederate generals, or more recently, of one of the most ambivalent symbols of the so-called New World: Christopher Columbus. The events of Charlottesville have set off a domino effect of confederate statues being toppled, defaced, and removed. In Durham, North Carolina, young activists tied a rope around the neck of a confederate statue and pulled until it fell and crumpled on the ground. Opponents have derided these acts as abominable, shameful attempts to “erase history.” In response to these critiques, recent articles have helped to contextualize the moment we are experiencing within a broader history of toppling monuments of dictators and symbols of colonialism across the globe during the twentieth century. What is missing from these discussions is a consideration of two key factors for understanding the wave of revolutionary iconoclasm sweeping the United States: temporality, and the materiality of monuments. In other words, why now? Why monuments? And what can the era of Tupac Amaru tell us about the time we are currently living in? 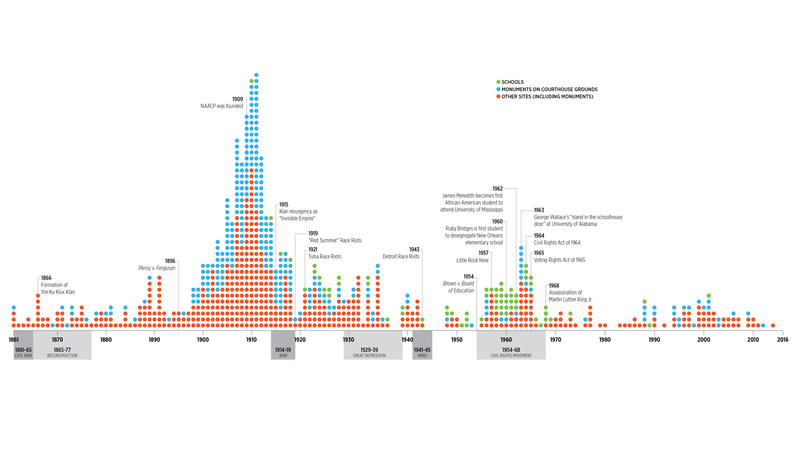 The vast majority of confederate statues were erected between 1900 and 1920, which coincided with the founding of the NAACP (1909) and the resurgence of the Klu Klux Klan. And timing matters. As a number of reporters, historians, and activists have pointed out, these monuments were not created immediately following the Civil War. Rather, they were installed during the Jim Crow era for the express purpose of laying the specter of the confederacy on an increasingly upwardly mobile African-American population. Just as the timing of the erection of these statues deserves consideration, so too does the timing of their defacement and removal. In the midst of a surge in hate crimes, the extrajudicial killings of black and brown people at the hands of law enforcement, an administration that likens Black Lives Matter to a terrorist organization, and a slew of injustices that cannot possibly be confined to a single essay, these statues become ever more menacing as a material apparatus upholding white supremacy’s entanglement with state power. It is precisely at a moment of political crisis in which democracy seems to be crumbling at our fingertips that inert, bronze icons of the confederacy become activated and reanimated as potent instruments of institutional representation and terror. And this brings us to the question of materiality. The toppling of confederate statues does not signify the obliteration of their history. If anything, it makes that history all the more palpable. The orchestrated defacement and takedown of these monuments have been recorded, photographed, and circulated in print and social media for millions to collectively bear witness of their demise. Most of us may never have known about the confederate statues in Durham prior to 2017. But now we know them for their afterlives, memorialized in photographs of their demise. The monuments become even further engraved into our collective memory by virtue of these interventions. Many of the individuals involved in the removal of confederate monuments have been arrested and charged with vandalism. The government and mainstream media’s framing of these interventions as vandalism only underscores the profound role that institutional power—derived in part from the very fictions of nationhood that these statues represent—plays in the pairing of defacement with deviancy. This is certainly not the first time that statues of colonial figures have been subjected to revolutionary intervention. On October 12, 1992, the 500-year anniversary of Columbus’s “discovery” of the Americas, Maya activists toppled the statue of Diego de Mazariegos, the Spanish conquistador who invaded Chiapas in 1528. The quincentenary marked a moment of profound reflection for indigenous peoples across the Americas, who staged counter-protests and demonstrations to send the message that the colonial legacies of 1492 remained ongoing into the twentieth century. Statues of Christopher Columbus have also been a recent target, with a growing list of defaced statues in Baltimore, Binghamton, Buffalo, and New York City, all within the past year, with the examples sure to increase as we approach Columbus Day. While the statues of Confederate soldiers and generals have generally been toppled down and removed from their platforms, statues of Columbus have been doused in red paint. The addition of red paint, as the Central Park statue so poignantly reveals, demonstrates the “blood on the hands” of the explorers and conquistadores who invaded the Americas. The application of paint appends an alternate history to the statue. It provides a counternarrative to that of splendor, discovery, and grandeur communicated by these commemorative monuments. While these provocative acts of icon destruction may seem violent or jarring, the attacking of statues will never remotely approximate the systematic attack on human life and dignity that they tacitly enshrine. But rather than only see these material interventions as forms of destruction, we can also view their radical recontextualization—the application of red paint to Columbus’s hands, the raising of a fist next to a toppled confederate soldier—as a kind of world-making. It signifies new realms of possibilities in which people today collectively remember, grapple with, and persevere over the violent pasts that brought them into being. The works of art discussed in this essay form but one lineage of objects that underwent modification and defacement during periods of acute political tension. While the historical contexts are distinct, we can begin to trace commonalities that cut across the temporal and geographic boundaries that separate the world of Tupac Amaru from the present. Metaphorically bloodied and mutilated statues can also open up a space for new possibilities. One person’s iconoclasm is another’s liberation; it is up to us to excavate these histories to better understand the powers and conditions under which people are moved to strike an image. Ananda Cohen-Aponte is Assistant Professor of Art History at Cornell University. She is author of Heaven, Hell, and Everything in Between: Murals of the Colonial Andes (University of Texas Press, 2016). She is currently working on a new book project on the visual cultures of insurgency in the 18th-century Andes. You can follow her on Twitter at @drnandico. She is grateful to conversations with Allison Curseen and Rafael Aponte that inspired this post. Juan Carlos Estenssoro, “La plástica colonial y sus relaciones con la gran rebelión,” Revista Andina 9, no. 2 (1991): 415-439. David Freedberg, “The Fear of Art: How Censorship Becomes Iconoclasm,” Social Research 83, no. 1 (2016): 67-99. Scarlett O’Phelan Godoy, Un siglo de rebeliones anticoloniales. Perú y Bolivia, 1700-1783 (Cuzco: Centro de Estudios Rurales Andinos “Bartolomé de las Casas”, 1988). Sinclair Thomson, We Alone Will Rule: Native Andean Politics in the Age of Insurgency (Madison: University of Wisconsin Press, 2002). María Eugenia del Valle de Siles, Historia de la rebelión de Túpac Catari, 1781-1782 (La Paz: Editorial Don Bosco, 1990). Charles Walker, The Tupac Amaru Rebellion (Cambridge: Harvard University Press, 2014). Natalia Majluf, “Manuela Tupa Amaro, Ñusta,” in La colección Petrus y Verónica Fernandini. El arte de la pintura en los Andes (Lima: Museo de Arte de Lima, 2015), 158–85. Luis Durand Florez, ed., Colección documental del bicentenario de la revolución emancipadora de Tupac Amaru, vol. 3 (Lima: Comisión Nacional del Bicentenario de la Rebelión Emancipadora de Tupac Amaru, 1980), 275–76.